The unseeded Russian claimed his second ATP World Tour title of the season. 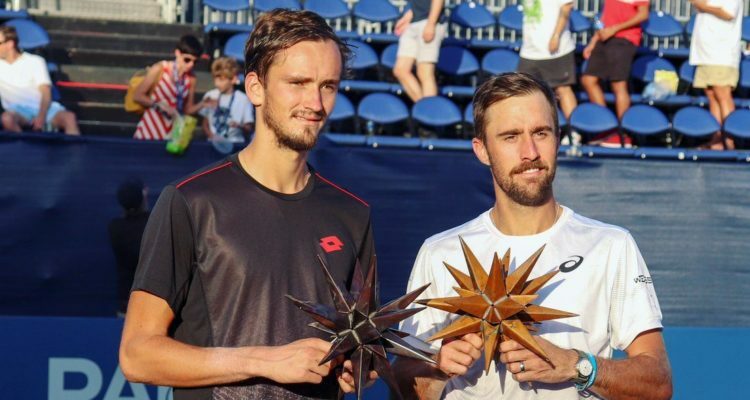 Daniil Medvedev won his second career ATP World Tour title, both of which have come in 2018, at the Winston-Salem Open in North Carolina, defeating US-American Steve Johnson, 6-4, 6-4 in Saturday’s singles final at Wake Forest Tennis Center. The 22-year-old-Russian saved the only break point he faced, converting two of his own to secure victory in one hour and 24 minutes. “It feels amazing,” said Medvedev, who also lifted the trophy earlier this year in Sydney. “At the beginning of the week, I didn’t think it was going to be possible because I was playing quite good, but I didn’t feel I was at the right form to win a title. Medvedev begins his US Open campaign against fellow Russian Evgeny Donskoy on Monday. This entry was posted in ATP 250 Winston-Salem, ATP Tour and tagged ATP World Tour, Daniil Medvedev, Winston-Salem Open.